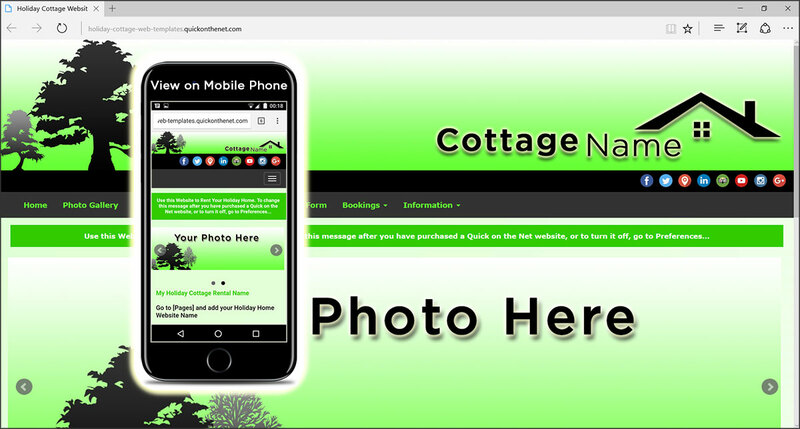 Designed to give you a presence on the internet in the fastest time possible, our property rental websites have been created by professional designers and already contain a stylish cottage logo graphic. Cottage design does not have to be dull and boring; and you will quickly discover that our creative concept is modern and engaging in its appearance. Notice how your website already includes a useful suite of menu buttons. Plus, you can also add, remove or rename the menu options to suit your exact needs. Also available in bright blue, these holiday home website templates are perfectly suited for a leafy country cottage, or a beach villa retreat by the sea. Building an attractive property site can take time and effort, but you will quickly discover we have already done a lot of the hard work for you. Sign-up, log in, upload your photos and add your information. You will be pleasantly surprised with how quickly it can all happen.